The summer so far has been wonderful for us glampers, campers, and outdoor explorers. It has been sunny and hot. Almost like a summer abroad. Such prolonged sunshine inspires us all to venture outside more and to embrace a camping and glamping staycation. However, this warm weather also brings the minibeasts out in abundance. Being pestered by bugs can be the bane of outdoor life; we’ve all had a picnic ruined by ants or wasps. 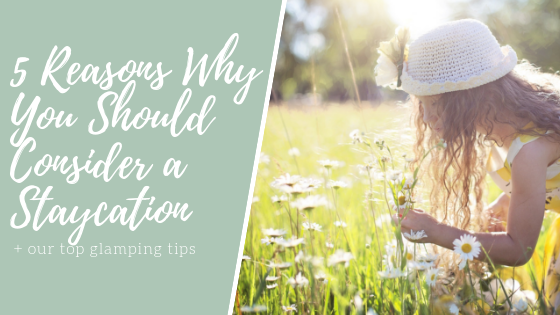 But do not worry, with a few glamping hacks up your sleeve, you can enjoy a break without the stress of fly swatting and wasp freak-outs. 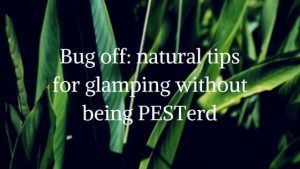 We have a learnt some great natural bug repellent hacks for you to use next time you’re outside. The best thing about glamping in the Midland’s countryside is the peace and relaxation. Our guests this summer have been sunbathing, reading, going for walks and soaking in the hot tub under the stars. Sounds like bliss, right? To do this without the rude interruptions of bugs we found that coffee and peppermint oil are the best natural repellents. Most bugs don’t like strong smells and smoke. Burning coffee grounds will combine these things perfectly. It’s incredibly easy to do. It’s entirely natural and much safer for you and the earth than any commercial product. The burning of the coffee intensifies the smell and creates smoke that acts as a danger signal to all minibeasts, especially the flying kind. 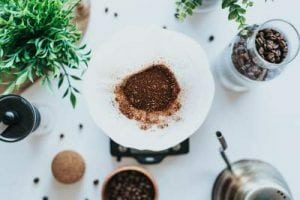 This method is great because you can burn the dried-out grounds from the coffees that you’ve been drinking throughout the day. Start with dry grounds. If you are using used grounds, put them in a bowl until the grounds are completely dry. Set up several of these burning stations around the area of the gathering. Using coffee grounds to keep bugs away is super cheap and easy. If you’re staying at Country Bumpkin Yurts and are not a coffee drinker, we will keep the used coffee grounds from the Canvas Café for you. Peppermint oil is a delicious smell for us but is too pungent for many in the bug-world. It is great for repelling ant and spiders. This is great news for glampers. 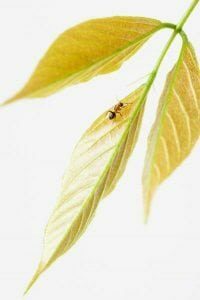 The ants coming to join your alfresco dinner and the spiders joining you in the yurt for shelter are not always welcome, so try these methods of using essential oil. Diluting it with water and spraying the perimeter of areas you’re trying to protect. Go for the picnic table legs and around the door of your tent. If you’re diluting the oil, mix 10 drops of peppermint essential oil and 16 oz. of water, then transfer to a spray bottle. This may not be a totally free method like the coffee but if you buy a little bottle of peppermint oil it will last you for multiple camping and glamping trips. It’s a worthwhile investment. Both methods are wonderfully natural, cheap and easy. By giving these glamping hacks a try when you are away you can relax without being pestered by bugs. You can go back to sipping your locally brewed cider whilst manning the bbq in peace. Bliss can resume. 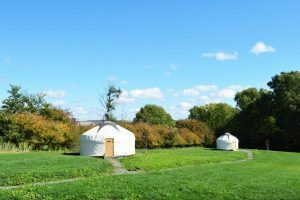 The summer holidays may be coming to an end but don’t that stop you from going glamping in the Midlands countryside. We are open all year round so you can book with us to enjoy a late summer or early autumn break. Check out our availability and book here. ← Canvas Café: why organic, free range and local food is important to us.